What did you do for your GMC today? I'll start. Today I ran all the gas out of Cecilia and left her to sit dry for a bit. I plan to pull out the new sending unit I put in and try different resistors on the wire to see if I can get it to read right when it's empty. For some reason, and I know I bought the right one, but for some reason it still shows just shy of 1/4 of a tank when it's empty. This is the reason AAA loves me so much. I run out of gas all the time! Re: What did you do for your GMC today? I have just tweaked( bend, readjust, reshape ) the rod a little so the float went down further at the lowest position. I thought about it more , since you are reading 1/4 tank when empty, you may have to bend it so the float is higher. You're trying to match the end of the travel to the float close to hitting the bottom of the tank. Last edited by jagarra; February 6th, 2019 at 08:18 PM. Today I did a little reading about using lead substitutes, walked a couple circles around the truck, rubbed my hand on it the knocking some peeling paint off, went and looked at new bed wood that is Stacked in the corner In the house (which momma thinks is really cool sitting in the house). And felt sad for letting it sit in the rain. Gotta get her back in the garage ASAP! Ordering a new gas tank and sending unit. Also prepping parts list so i can turn over the engine soon first time in 7yrs! Fetch, Have you considered bending the arm downward a bit? Cigars are good. Haha! Seven years, that's going to feel great! It's 1/4" from the bottom. I cut my old tank apart to measure it out perfect. I don't know what's wrong with the little sucker. What cigars do you like best? Cold start without plugging in, 13 below zero. 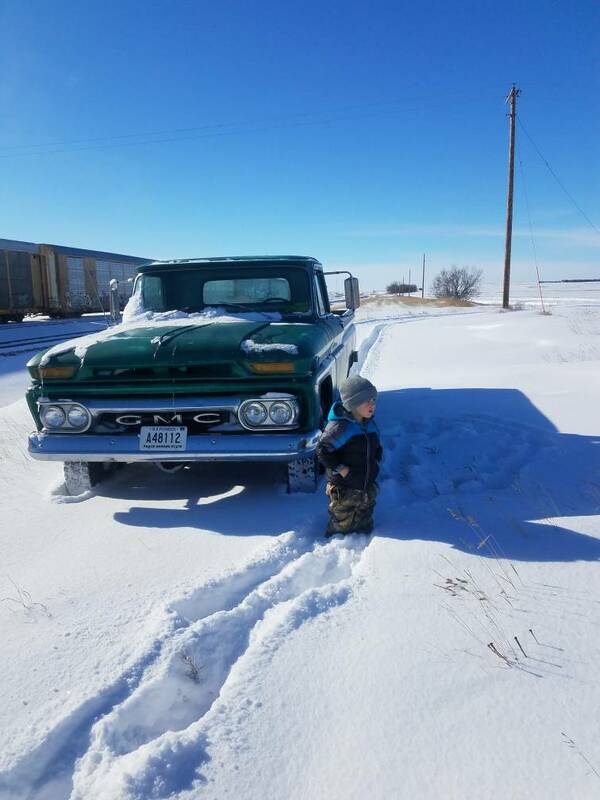 Took my grandson out for a ride in the new snow. Since you have the sending unit out, hook it up to the wires going to gauge and see how it reacts as you move it through it's range. You mentioned you ordered a new sending unit, does the ohms reading between the sending units match?